We aim to strike a balance between child-initiated and teacher-directed activities. Thereby inspiring the young ones to become focused, self regulated learners and to coordinate activities and ideas with others. We provide a curriculum based on solid research to build academic skills and life skills among children. This effective program has a low teacher to child ratio to meet the individual needs of all the children. Teachers are constantly upgrading themselves by keeping pace with the current research and by being the part of professional development programs. A child’s curiosity and natural eagerness to learn is encouraged which develops abstract thinking and promotes a lifelong love for learning. The transformed learning spaces are designed and organised to ensure that the children have space for all the activities involving quiet time, group time and community time. We are accomplished educationists, linguists, mathematicians, personality trainers with global education and international experience, who themselves run the institute with extremely high standards, personally monitoring the developments and taking utmost care possible. It is important for a Parent to understand we have earned the education, knowledge and expertise ourselves in what we do and claim. The internationally designed facilities by our team of interior designers are purpose built for kids with very a high emphasis on cleanliness and sunlight. We are highly technologically –driven with Internet ready Wireless classrooms and latest touch-screen smart boards and high-end Projectors, best of digital Learning aids and educational Software available around the world. We have as much Open Play Area as much as Indoor Area. Open gardens with splash pools and swings allow the children to play around and be close to the environment. A lot of our internationally-approved play products have a highly scientific value to them as years of proven research has gone in, whose astonishing results would be borne by the students for the rest of the lives. If you want to know more, please ask for details. We take pre-schooling with great seriousness and due care, as it should be taken, with a result-oriented approach but all in a highly caring, loving and approachable setting. 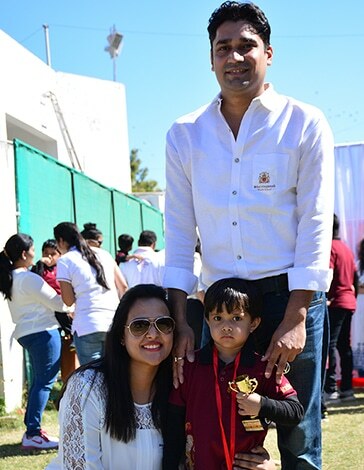 Once your child joins us, he or she becomes the part of the school family and, in the process, you as the parents, automatically become our valued actively participating stakeholders with a very special place in the school. There would be special programs for you too. We have absolutely limited number of seats and cannot allow further admissions due to stringent quality requirements. We have a strict NO DONATION POLICY. Our fee structure is purposefully kept affordable and transparent. There is absolutely no question of any additional/ hidden costs involved anywhere mentioned other than the fee structure document. One fee is applied to all.